The Senate Homeland Security and Governmental Affairs Committee held a hearing Tuesday on federal programs that have funneled billions of dollars in military hardware to state and local police forces. 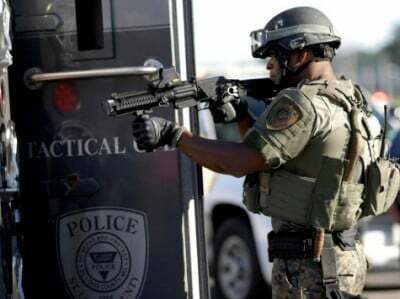 Under the heading “Oversight of Federal Programs for Equipping State and Local Law Enforcement,” the Committee called witnesses from the Defense Department, FEMA, and the Justice Department, as well as numerous “independent” experts, to testify about the militarization of American police as well as the events last month in Ferguson, Missouri. While the hearing was promoted in the press as an official “review” of the militarized police tactics seen in Ferguson, Missouri, its actual purpose was to support the continuation and regularization of the anti-democratic programs. The hearing procedures expressed the unanimous support within the political establishment for the decades-long conversion of local police departments into paramilitary forces. The only reforms presented were intended to make the militarization of police more efficient, not to scale it back. At no point in the proceedings were the actual motivations for the militarization of police mentioned; the explosive growth of inequality and poverty in the past 25 years, constant wars abroad, and the attack on democratic rights did not merit so much as a whisper. The right-wing character of the hearing was made plain by the opening remarks of committee chairman Tom Carper (D-Delaware). Carper stated, “These programs were established with very good intentions. The question is whether this equipment matches what the police truly need to uphold the law.” He then went on to cite the lockdown after the Boston Marathon bombings in 2013 as proof that the programs were necessary and effective. The witnesses were treated with kid gloves. At no point were any of the political issues involved brought to the fore. Senators continually prefaced their remarks with glowing depictions of the “brave men and women” in state and local police departments. Setting the tone for the session, Carper began the questioning by asking the witnesses what could be done to “[enable] law enforcement to have some of the resources that they need to meet the level of risk in their communities.” Republican senators Tom Corbin and Rand Paul, for their part, made a show of criticizing the programs, portraying them as federal overreach, in order to further their own right-wing states’ rights policies. Brian Kamoie of the Federal Emergency Management Administration (FEMA), in remarks that were passed on in silence by the committee, said that the secretary of the Department of Homeland Security this year identified 38 urban centers as “high risk” areas, a designation that prioritizes the flow of funds to their local police departments, in consultation with both the Department of Justice and intelligence agencies. Despite this favorable treatment, the government witnesses tied themselves in knots defending their programs. Alan Estevez, head of the Department of Defense’s now-infamous 1033 program, which transferred billions of dollars in military hardware to local police, declared that the Pentagon exercised due diligence on requests for hardware by police departments, and that “if an agency requests 100 rifles and there are only ten officers,” the request would be rejected. When McCaskill cited two cases where departments with one sworn, full-time officer were each given fourteen assault rifles and two mine-resistant, ambush protected (MRAP) armored vehicles, Estevez equivocated, stating that he would have to look into it. The Senate committee rounded out its panel of “experts” with two representatives from police organizations who were asked for input on how to improve the image of militarized police forces. Scaling back or reversing these programs was categorically ruled out. Jim Bueermann, president of the Police Foundation, provocatively asserted, “Anyone who thinks that we’re not going to have tactical teams or high-powered weaponry in policing in the United States just has not been paying attention.” No members of the committee took issue with this assertion.